The Governor of Aruanchal Pradesh Brig. (Dr.) B.D. Mishra (Retd.) met the Union Minister of State for Culture (Independent Charge) Dr. Mahesh Sharma at New Delhi on 22nd October 2018. The Governor impressed upon the Culture Minister the pressing need for Music Academies in Arunachal Pradesh. He informed the minister that with its diversity in cultural heritage, the State of Arunachal Pradesh is bestowed with large number of different music and cultural forms. These heritage and traditions needs to be preserved, promoted and propagated. Therefore, setting up of music academies will be a strong foundation in this endeavour. Every tribe of its 26 major and 106 sub-tribes has distinct and different cultural heritage, he said. The Governor also took up the proposal for holistic development of Parasuram Kund, in Lohit District. He also shared the finer issues of the proposal as he visited and interacted with concerned people of the famed place of pilgrimage. 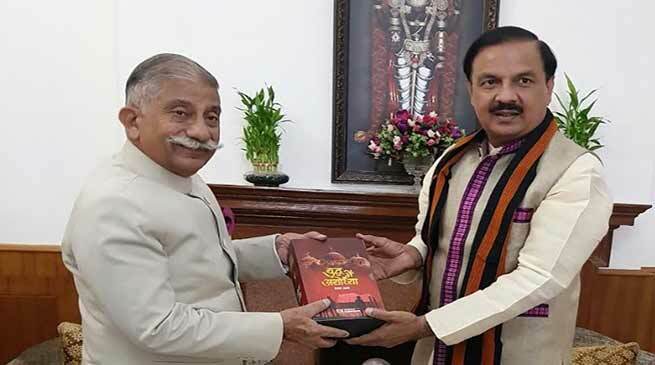 The Union Minister of State for Culture assured the Governor in expediting the process for Music academies to preserve and promote the Cultural Diversity of the country. Earlier in the day, the Governor met Rahul Bhatnagar, Secretary Sports, Ministry of Sports and Youth Affairs. They discussed about starting of Football Academies in Arunachal Pradesh. The Secretary to Govt. of India assured the Governor of the Union Sports Ministry’s full support in creating the Sports infrastructure in Arunachal Pradesh. State Minister for Sports and Youth affairs, Dr. Mohesh Chai along with Chairman, Sports Authority of Arunachal Bamang Tago and Mission Director, Khelo India, Arunachal Pradesh Gumya Karbak accompanied the Governor for the meeting.